ARLINGTON, Texas -- For more than two full years, Mikey Garcia never once wavered in his determination. He’d made a decision to try to break free of his promotional contract with Top Rank and take a larger role in controlling his career. He alleged that his contract with the powerful Las Vegas-based promotional firm was coming to an end. Top Rank chairman Bob Arum and president Todd duBoef disagreed, and the matter dragged on in the legal system for 30 months. Top Rank had far more resources, but Garcia isn’t the type to give up, even in the face of the longest odds. That’s part of the reason that Garcia challenged Errol Spence for the IBF welterweight title. He was going to fight for what he believes in, no matter the cost, no matter the consequences. There were plenty of skeptics who questioned the wisdom of Garcia’s decision, and gave him plenty of unwanted legal advice. “Everybody had an opinion and I heard about pretty much all of them,” Garcia said, laughing. He should give up the fight and get on his with career, he was told. Boxers have short careers and don’t make money if they don’t fight. But Garcia didn’t want to box just to box. He wanted to box to set records, to achieve greatness, to try to do the seemingly impossible. As weeks turned into months and then months turned into years without Spence stepping into the ring, his father, Eduardo, and older brother, Robert, would speak about the case. 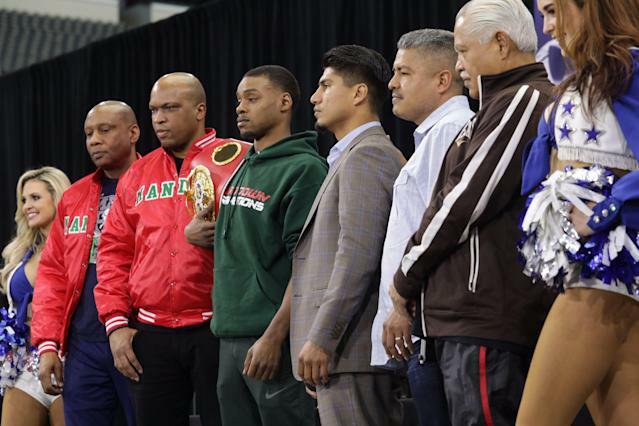 “My Dad and I, sometimes we would talk and say, ‘Man, is this thing ever going to end,’ ” Robert Garcia said on Wednesday following the final news conference before Mikey fights Spence in the main event of a Fox-produced pay-per-view card on Saturday at AT&T Stadium. Mikey got his career back on April 7, 2016, two days before Manny Pacquiao fought Timothy Bradley in Las Vegas. Arum mentioned it during a podcast interview, and the news began to spread quickly throughout the media center. At the time he decided to do battle in the courts instead of in the ring, Garcia was 34-0 and had 29 knockouts. He’d won belts at featherweight and super featherweight, but the sport was increasingly becoming a chore. And that wasn’t how to get the best out of one Miguel Angel Garcia. He wanted to challenge himself. If he felt it would make sense to jump two weight classes and fight one of the best fighters in the world, he wanted a promoter who would work with him. He felt that he was being dictated to and not able to pursue his career his way. Garcia changed the industry in a lot of ways. He won his freedom and he’s showing the way it should be done. He is only on a fight-to-fight deal, so he’s free to go where the best fights are. He recently sat down with Golden Boy Promotions executives to talk about fights. He did the same with Top Rank officials. Business is business and Mikey Garcia isn’t going to let hard feelings from business disputes get in the way of what he believes is best for his career. But he felt he couldn’t get that with Top Rank, and his older brother agreed. “It was well worth it,” Robert Garcia said of Mikey’s decision to take on Top Rank. “Right now, at the level Mikey’s at, you could see other fighters who are fighting under a promoter who aren’t in control of their careers. [Vasiliy] Lomachenko, he can’t choose his opponents. Bob Arum chooses his opponents. [Terence] Crawford, he can’t choose his opponents. Bob Arum is choosing them, and he already has two or three guys lined up for him. Both Robert and Mikey were trained by their father, but Robert took over Mikey’s career several years ago. They make a perfect team. Robert uses the same style and techniques as his father, but he’s not nearly as demanding on his brother as their father was on them. When Robert Garcia was an up-and-coming boxer, there was one thing he knew for sure: If he broke any of his father’s rules, there would be hell to pay. Eduardo Garcia had a passion for boxing that he tried to instill in all of his children. Eduardo Garcia, though, had very definite ideas on what a boxer should and shouldn’t do. If one of his rules was broken, it often wasn’t pretty. Robert knows when to lay off and when to push, and Mikey trusts him completely. Robert won a world title when Mikey was just 10, and he’s always looked up to his brother. Robert’s varied experiences appealed to Mikey. “He did it in the ring and he has all that experience, and then he became this great trainer,” Mikey said of Robert. “He listened to my dad. He learned from my dad and I think that’s what helps the most. He’s 12 years older than me, but we have a good relationship. Fox going all in for first PPV, but will it work?